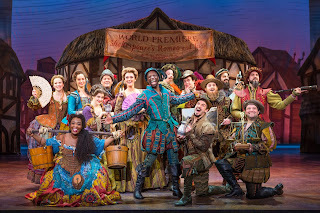 The opening night of Something Rotten!, playing at the Orpheum through April 8, overcame unforeseen circumstances to thoroughly reward the audience who slogged through the latest spring snowstorm to attend the show on Tuesday night. 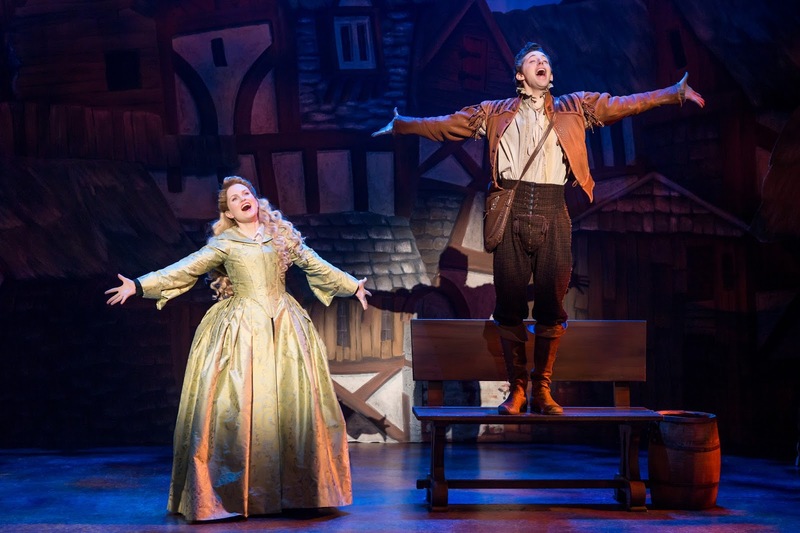 The touring cast boasts two well-known Broadway performers: Adam Pascal, RENT's original Roger, and Rob McClure, who was Tony-nominated for his Broadway debut as Chaplin. On Tuesday night, however, both actors were out of the show, allowing the audience to see the work of the unheralded understudies. 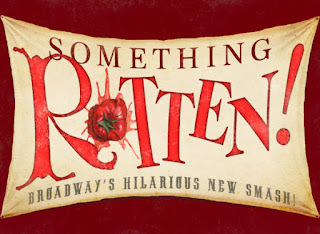 and the ensemble of Something Rotten! © Jeremy Daniel. A public service announcement: Sometimes audience members are disappointed with understudies, even if they didn't know about them until after seeing the show. And yes, it's cool to see people who you recognize from cast recordings or TV or movies on stage, but Broadway and touring understudies are not second-rate. If anything, they are working even harder because they know the audience was expecting someone else. I'm happy to say that Tuesday night's cast was top-notch. Scott Cote, playing McClure's usual role of Nick Bottom, was perfect as the beleaguered actor/playwright fed up with living in Shakespeare's shadow. And Daniel Beeman played the the Bard with all the ridiculous swagger appropriate to the show's vision of Shakespeare as a Renaissance rockstar. Do not fear the understudies, people! Back to the show itself. 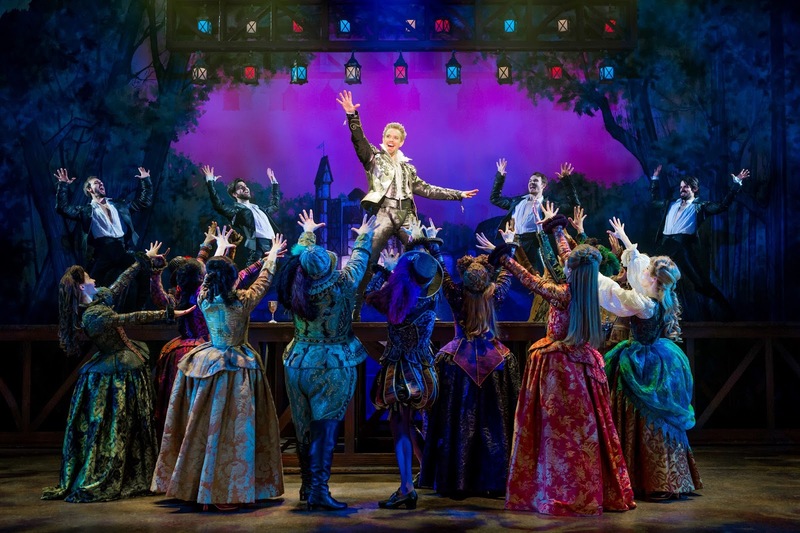 This outrageously original musical is set in 1590s London, where the struggling Bottom brothers desperately need a theatrical success, but are always one step behind Shakespeare, who used to be an actor in their company. Nick, who really hates Shakespeare (but is maybe a little jealous) visits a soothsayer to get ahead of the competition. Blake Hammond is a stitch as Nostradamus (not that one, his nephew Thomas), who gets his predictions right...sort of. Meanwhile, Nick's poetic younger brother Nigel, the real writer of the pair, has met an enchanting young Puritan named Portia. Josh Grisetti and Autumn Hurlbert are endearing as the star-crossed lovers who find a common passion for poetry. Unfortunately, her father (played by Joel Newsome) is denouncing the theater as sinful, even as he can't stop speaking in racy double entendres. And Nick's wife Bea (Maggie Lakis) decides to dress as a man to get a job to feed the family. When the soothsayer predicts that the biggest thing in theater will be something called a "musical," a song breaks out (of course) to sell Nick on the vision. Music, lights, chorus girls, tap dancing, and a rapid-fire stream of references ensue. If you're quick, you'll catch nods to A Chorus Line, Cats, Annie, South Pacific, RENT, Les Miserables, and many more. The script is filled with references to musicals, and of course, to Shakespeare's "Greatest Hits," some of which he recites in an outdoor performance: Shakespeare in the Park! The jokes are goofy, but they just keep coming. Even when a song explains that people always go nuts for a kick line, the audience eats it up when the cast lines up for some high kicks. I can't fully explain how happy this musical makes me, but I could certainly feel the audience around me having the same experience. See this show, and you'll probably even see the "stars", although I won't guarantee you'll enjoy it any more than I did! Here's a little bonus: The original Broadway Nick Bottom and William Shakespeare, Brian D'Arcy James and Christian Borle, performing a song and dance from the show. You're Gonna Love .... May!